The animals on the Kit Carson Carousel in Burlington, Colorado, look lively today thanks to meticulous restoration efforts. Childhood fun and American heritage are preserved in Burlington, Colorado. “It’s such a mess, it might be easier to burn it than clean it up!” was the consensus of folks in Burlington, Colorado, when they took a look at their carousel back in 1937. For years, it had been abandoned under piles of cornstalks and grain. It had become a roost for pigeons and stray birds, the home of gnawing mice and assorted rodents. Its once-elegant carved animals, now bedded down with real varmints and vermin, languished, growing filthy and faded. The carousel’s grand old organ was chewed by mice, and its pipes were clogged with trash and bird droppings. The carousel had been a target of anger and disgust since 1928 when county officials hauled it to this tiny Colorado prairie town, where most folks didn’t even want it. In fact, they were so irate that $1,200 had been spent to buy, of all things, a carousel, that they voted the wastrels out of office. The menagerie carousel was housed at the Kit Carson County Fairgrounds in a building that was used to store grain. When the Depression brought hard times to the prairie, there was no thought of holding the county fair, much less running a frivolous ride. In 1937, the people of Burlington decided to haul out the carousel and spruce it up for their first county fair in years. It took a lot of soap and scrubbing, but eventually the drab animals were clean and ready. Since the organ was in ruins, the menagerie paraded around in silence or to recorded country and western tunes for the next 40 years. This was a far cry from the carousel’s early days, when 46 animals pranced around at Elitch Gardens, a Denver amusement park, where the ride was the high point of every child’s visit. Produced in 1905, this antique ride, dubbed PTC No. 6, was one in a series of only 74 carousels that were made by the Philadelphia Toboggan Company (hence the PTC in its name). The features of the animals were lifelike, with every detail carefully hand-painted by artisans. The deer bore real antlers, and the flashy chargers sported tails of genuine horsehair, while a tall giraffe, showy with his rich brown spots, wore a slithering snake coiled around his neck like an exotic necklace. Four carved chariots, elegant with gold leaf and enamel, joined the frolicking horses, goats, camels, and zebras, as well as a reindeer, a fierce lion, a snarling tiger, a sturdy mountain dog, and a mythical sea creature called a hippocampus. In 1975 a new generation of people in this town of 3,000 decided to restore their old carousel as a project for America’s Bicentennial and to celebrate Colorado’s 100th birthday. “Our first fund-raiser was a cookbook sale, featuring the favorite recipes of the county’s best cooks,” said Jo Downey of Stratton, Colorado, who is vice president of the National Carousel Association (NCA). Public interest grew with the citizen fund-raisers while grant money and donations were sought to help support the restoration. Raising money wasn’t easy, but 30 years and several million dollars later, the antique carousel, sparkling like new, is now listed as a National Historic Landmark. A small 1920s fairground exhibit building has been renovated and now houses a museum dedicated to the carousel. It has wonderful displays showing the restoration of PTC No. 6. “Planks to Ponies” demonstrates how artisans at the Philadelphia Toboggan Company carved the magical creatures from plain pieces of wood and then carefully applied the brilliant paints. Take a seat in an elegant chariot and watch a video showing how dark layers of old varnish were carefully removed, exposing the original paint, gold leaf, and fine details. The restoration of the pastoral scenes that had been painted on 45 decorative panels of fine muslin is outstanding. Years of dirt and grime had obscured oil paint colors, and the panels were water damaged, punctured, and torn. The video shows the delicate repairs and restorations that were made by the fine art conservator, returning the panels to their original beauty. Carousel conservationists come from around the country to marvel at this painstaking preservation, which has established a new standard for restoration of these rare antiques. Norma Pankratz of Burlington, who’s been involved in the carousel restoration since the beginning and is executive secretary of the NCA, proudly pointed out the museum’s NCA miniature collection of menagerie animals. “They’re all hand-carved and painted by Jerry and Marilyn Reinhardt of Kansas,” she said. “Their work has been recognized nationally as being one of the best.” The finely crafted models are about 11 inches high and capture the beauty of the original wooden carousel figures. It has taken more than 20 years to complete restoration of the carousel’s Monster Military Band Organ, one of only two remaining in existence. In 1976 it was in deplorable condition; its wooden pipes, once sounding like flutes, violins, and cellos, were warped and cracked, resembling a pile of kindling. Brass pipes were dented or missing, emitting squawks and squeaks rather than trumpet and trombone sounds. The 100-key instrument stands almost 7 feet high and more than 8 feet wide. It was so big it had to be hauled in pieces to a restorer. Today the organ sounds just as it did back in 1909, providing wonderful waltzes and rousing Sousa marches. When you ride the carousel, you will notice the animals do not go up and down, as on some other merry-go-rounds. Instead, this one has speed. It can travel up to 12 miles per hour “” faster than most others. Special Christmas opening. The carousel and museum normally are open and in operation daily from Memorial Day to Labor Day. But if you happen to be traveling nearby on the first Sunday of December (December 5, 2010), stop by for the Carousel Christmas event, from 1:30 p.m. to 3:30 p.m. Refreshments, carousel rides, and admission to the museum will all be free, and the carousel itself will be decorated to honor the holiday season. Even the carousel’s organ will be playing carols. By the way, early Christmas shopping will be available at Hoofbeats, the carousel gift shop. The complex has 21 historic buildings, many of which were moved from surrounding communities. Each is authentically restored and furnished. You can stroll around to see the town bank, barbershop, jail, or lawyer’s office. A general store, essential in every rural community, reflects the commerce of its day with an authentic cash register, scale, and cutters for tobacco and cheese. The store’s tiny post office, tucked away in the corner, was a popular mail distribution spot. A cowboy soaks in an old tub at the barbershop, a common practice when they came to town for a shave and a haircut. The Doll House has more than 200 different dolls spanning the years, including a bread-dough doll and one with a head made from an apple. The Harmony Schoolhouse dates to 1911 and has seen generations of youngsters practicing their ABCs with old-fashioned pens. The sod house, with its grassy roof, exemplifies the type of home built by many who came west to a prairie with few trees. Recorded interpretive messages in each building explain its importance, making a self-guided tour ideal. The museum boasts a collection of antique buggies, restored carriages, and farm wagons; vintage tractors; the local milk wagon; a Model T Ford; and even the wagon used by Dr. Deckert, peddler of potent potions, liniments, and cure-alls. Realistic displays of frontier life include an old chuck wagon that’s seen plenty of roundups and a covered wagon that brought settlers west. Kids can get a taste of prairie life as they card wool, roll yarn, and stamp quilt patterns in interactive exhibits. The displays of rural Victorian life are carefully assembled with heirlooms, appliances, and utensils necessary in a well-run home of a century ago. You can shop at the Old Town Emporium, crammed with porcelain dolls, flowery hats, handmade baby clothes and wooden toys, jewelry, wreaths “” nearly every imaginable type of craft and gift. While you’re there, take a break to get some ice cream. On weekends in summer, you can catch a ride to Old Town from the Kit Carson County Fairgrounds via the Old Town Express, a bright red, horse-drawn wagon. Old Town Museum and the Kit Carson Carousel, with its whirling menagerie of animals, sparkling lights, and kaleidoscope of colors, are tributes to the people of this rural prairie town. What they lack in population, they make up in heart, pride in their heritage, and the desire to preserve history for future generations. Burlington is at exit 437 off Interstate 70 in eastern Colorado, near the Kansas state line. Follow signs to the fairgrounds. 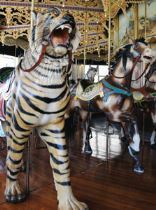 The carousel is open daily between Memorial Day and Labor Day; rides cost 25 cents and museum admission is $1. Plenty of RV parking is available at the county fairgrounds near the carousel and the carousel museum. Old Town is open year-round; some activities are offered during summer only. Admission is $6 for adults, $5 for seniors, $4 for children 12 to 17, and $2 for children 3 to 11. Ample RV parking is available.